1. An impressive individual who is hard to fault. He is clean fronted , has good depth of rib and is wide topped. 2. He has good feet and legs. His hooves have outstanding shape with plenty of heel and the right set to the leg. 3. 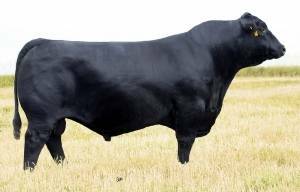 Megahit's daughters are extremely balanced, with good rib , nicely attached udders with short teats, and they have that feminine broody look. 4. An outcross bull that will add a lot of pounds to your calf crop.